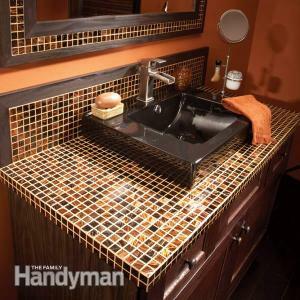 Make a gorgeous bathroom vanity top from mosaic glass tiles. This is going to be a luxurious vanity top, for a much smaller price than granite or marble. For this project you'll need standard carpentry tools and a 3/16-in V-notch towel, a grout float and grouting sponge. Microfiber cloth works better than cotton for cleaning grout haze. 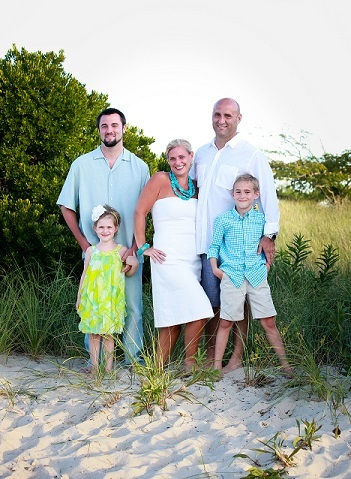 We used a lightweight tile backer board that can be scored and cut with a utility knife. Cement works just as well. Look for special glass tile mortar (white). It's available in a powder that you mix with water. This projected we used nonsanded grout for smooth lines. Make a sample board by gluing some tiles and grouting them to make sure you like the result. 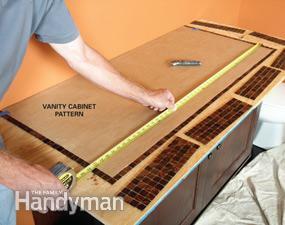 Cut a paper pattern the size of the vanity and lay it over the tile. 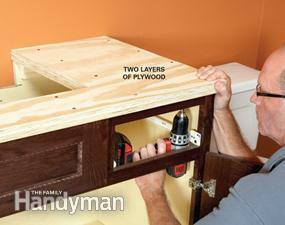 Aim for 1/2-inch overhang on the sides and between 1/2 and 1-inch past the drawers on the front. To figure the size of the plywood, add the thickness of the tile, backer board, the thin-set, and subtract this amount from the width. Deduct twice this amount from the length. Cut both layers of plywood exact. Plan the sink location and make the cutout. Cut the backer board the same size as plywood and make the sink cutout. Screw the plywood together, then screw it to the vanity, making sure the overhang is even. Mix the thin-set mortar, spread it on the plywood with the V-notch trowel, and screw the backer board to the ply. clean the top and edges, wrap the cement board tape around the corners, then cover with thin-set mortar. Make sure you flatten and spread evenly. After it hardens, scrape off any lumps. Set the tiles as quickly and accurately as possible. When satisfied, take a flat wood block and embed the tile. The next day, mix the grout until it's like mayonnaise. Work the grout from all angles to completely fill the joints, and scrape off the excess. Wait until you can't make a fingerprint, then clean it with a sponge. When finished, coat with a sealer.